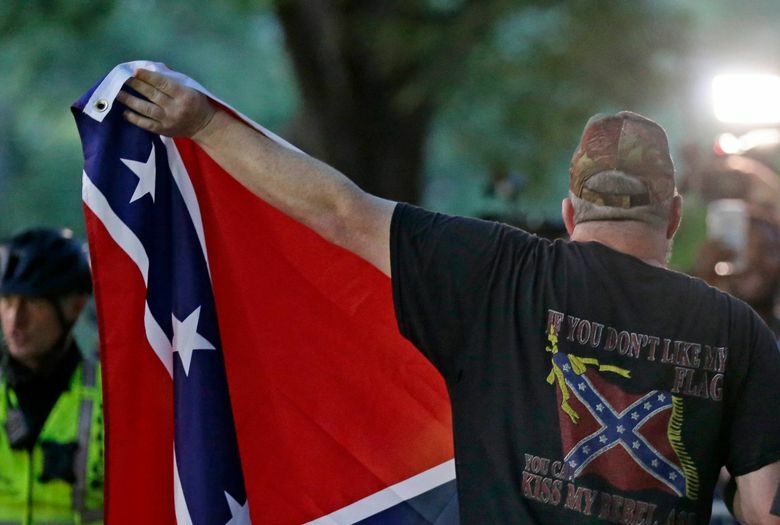 HILLSBOROUGH, N.C. (AP) — The protesters who brought down a Confederate statue at North Carolina’s flagship university acted with “a righteous show of people power” after university leaders refused to remove it, one of those accused in the demonstration said Thursday. Raul Jimenez, who was previously acquitted of helping topple another Confederate statue in nearby Durham, briefly appeared in court on misdemeanor charges of rioting and defacing a public monument. 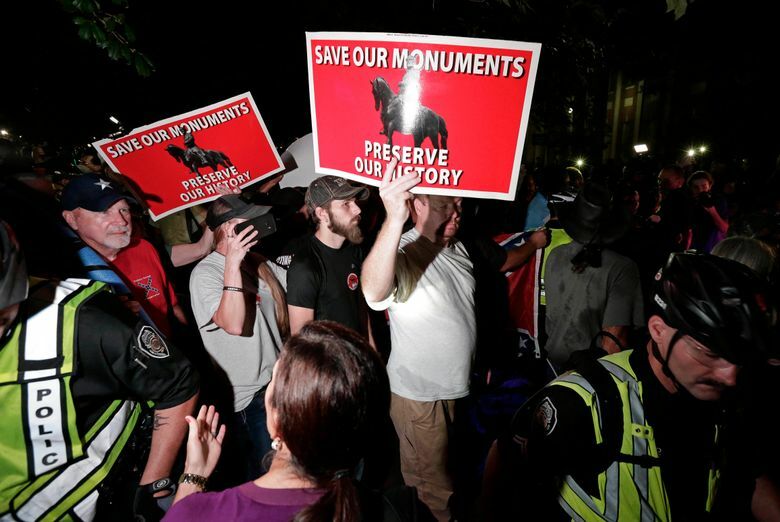 Three others have later court dates on the same charges of helping to tear down “Silent Sam” at the University of North Carolina in Chapel Hill on Aug. 20. University and legislative leaders have demanded a hard look at how a “highly organized” group of protesters used banners to conceal their preparations to bring down the statue with a rope — and why police were non-confrontational. 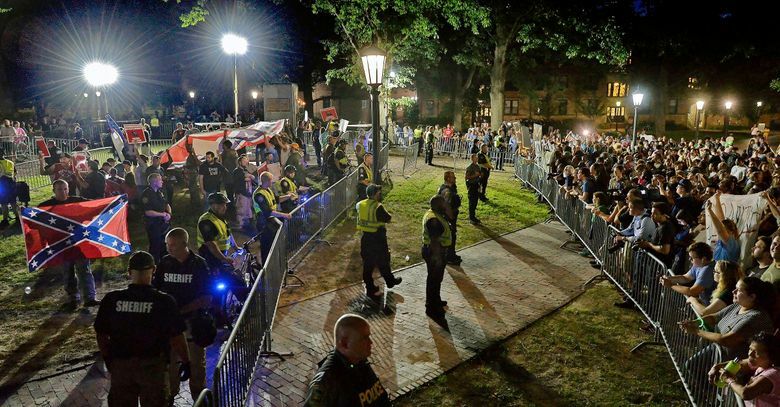 Thursday’s hearing came a day after public records revealed that a town police chief assisting the campus force with crowd control told his officers to stay back not long before the statue fell. 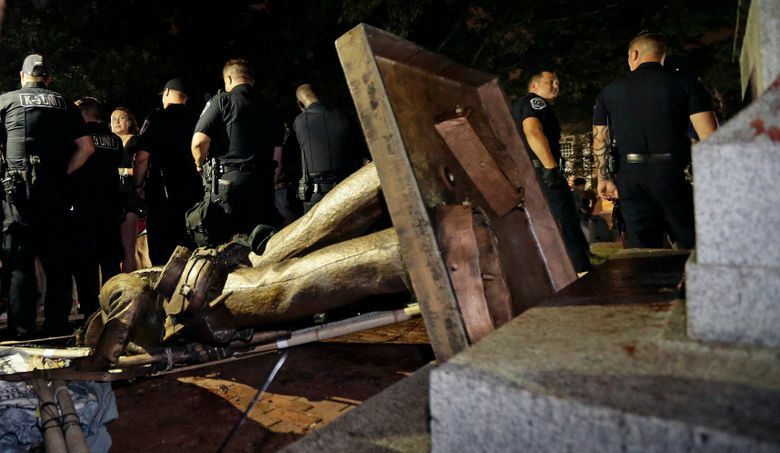 UNC Chancellor Carol Folt “has been asked by students and faculty to take this statue down, trying to go through legal channels … but she has refused and so the community took action,” he said in an interview. 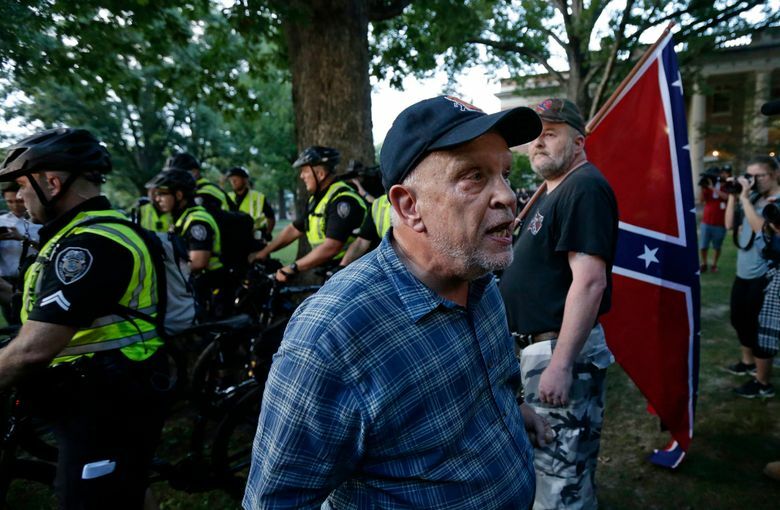 Tensions remained high more than a week after the bronze statue was taken down. 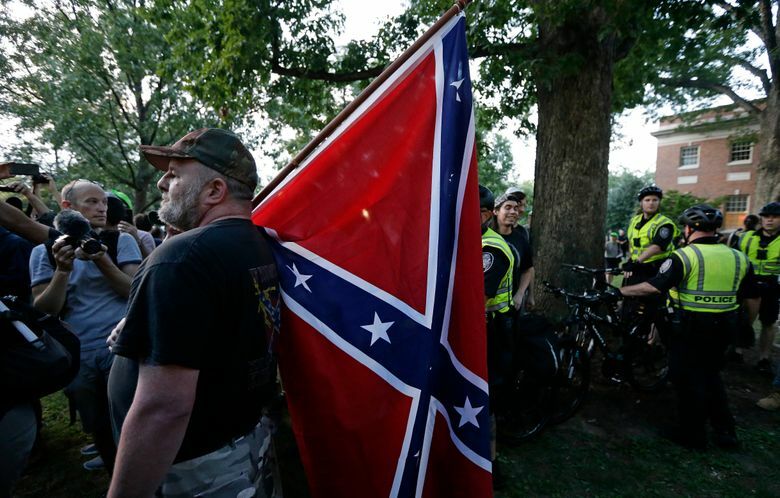 On Thursday night, a few dozen pro-Silent Sam protesters gathered on the school’s campus near where the statue had stood. 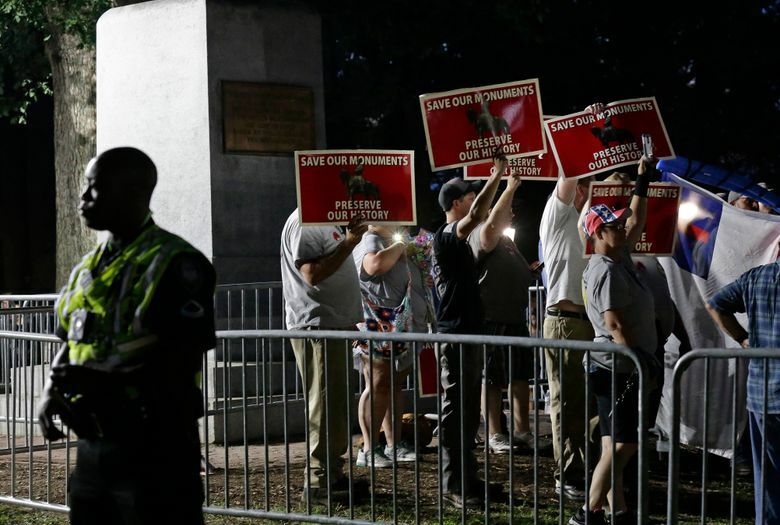 Authorities kept them separate from a larger group of counterprotesters who had gathered for a “dance party” to celebrate the fall of the statue. Police said they deployed pepper spray multiple times to keep order, university spokeswoman Carly Miller said in a news release. Miller said two people were arrested for affray, while a third was arrested for resisting an officer. Officials did not release their names or say if they were protesting for or against the statue. There were no injuries reported. The university also released a statement earlier Thursday showing a fourth person has been charged with helping topple the statue. UNC police have primary responsibility for patrolling the campus, but the two departments assist each other. It’s not clear why the campus police took a less confrontational approach than at previous protests. Blue’s department has also been under scrutiny after a photo surfaced of an officer on duty that night with a forearm tattoo resembling an anti-government group’s logo. Town manager Roger Stancil issued a statement this week that the officer was placed on paid leave for displaying “a tattoo that is associated with the ‘3 Percenters,'” and an internal investigation could result in disciplinary action. Silent Sam had stood in a main campus quad since 1913. 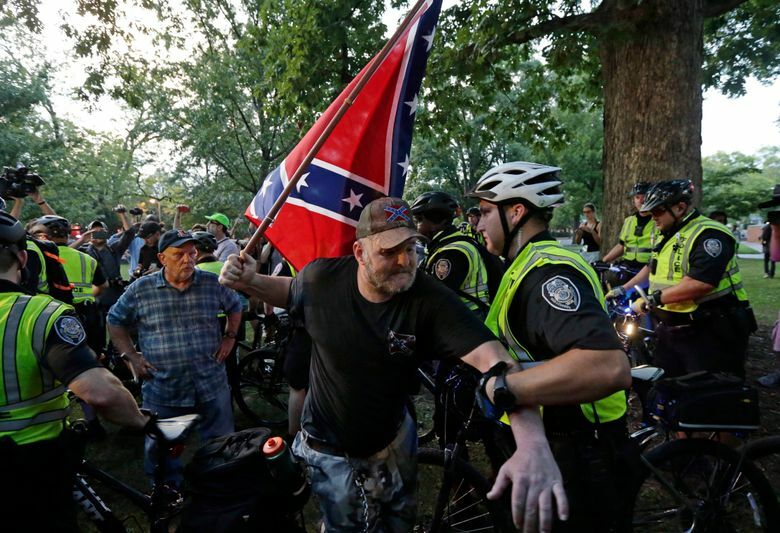 It came down about a year after a Confederate statue in Durham was felled by protesters using a ladder and a rope, while deputies took video but didn’t intervene. A Durham judge found Jimenez not guilty of defacing that monument and dismissed cases against two others after prosecutors had problems proving the identity of protesters shown on video. The Durham district attorney later dismissed charges against the remaining five.